Increasingly complex and widening conflicts have taken a huge toll on children in much of the Middle East in 2015, with parts of Africa and Asia facing protracted and relapsing wars that show no signs of abating, wrote Leila Zerrougui, the Special Representative of the Secretary-General for Children and Armed Conflict, in her annual report to the Human Rights Council. The Report covers the period from December 2014 to December 2015. The Special Representative reminded all involved that respect for human rights must be the basis of an effective response to extreme violence and actions must be undertaken in full compliance with international, humanitarian, human rights and refugee law. She added it is essential to emphasize the crucial role of prevention, as detailed in the UN Secretary-General’s plan of action to prevent violent extremism. Addressing the root causes of extreme violence, such as poverty and lack of economic opportunities for youth, lack of good governance, alienation of communities and political grievances, are necessary steps to find a lasting solution. In the report, Leila Zerrougui expressed her deep concern at the increasing number of attacks on schools, as well as military use of schools, in countries affected by war. Again in 2015, conflict disrupted the education of millions of children, creating a direct challenge to the realization of the Sustainable Development Goal of ensuring quality education for all children. She called for additional funding for education in emergencies and reminded all parties to conflict of their responsibility to ensure safe access to school. 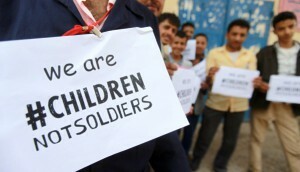 In 2015, the momentum generated by the campaign Children, Not Soldiers remained strong and led to a significant reduction of verified cases of recruitment and use of children by national security forces, especially in Afghanistan, the Democratic Republic of the Congo and Myanmar. The campaign continued to mobilize political support, provide technical assistance and resources to the Governments in the process of implementing an Action Plan to end and prevent the recruitment of children. Unfortunately, renewed conflict reversed most progress accomplished in South Sudan and Yemen. A majority of non-state armed groups listed by the Secretary-General for grave violations against children (32 out of 49) are active in countries concerned by “Children, Not Soldiers”. The campaign contributed to strengthening the tools in place to address the recruitment of children and generated new openings to engage in dialogue with armed groups on the protection of children. “Through the campaign, Governments are developing or strengthening the legal framework to criminalize the recruitment of children and investing more resources and energy to fight impunity. This has created new openings to address other grave violations committed against children committed by all parties to conflict,” said the Special Representative, who is currently on mission in Afghanistan. In her report to the Human Rights Council, Leila Zerrougui detailed how she used every opportunity of engagement with non-State armed groups and urges Governments to facilitate dialogue with a view to ending grave violations against children. In her recommendations, she encourages Member States to treat children associated with armed groups primarily as victims and to use deprivation of liberty as a last resort and for the shortest time possible. She also calls for the universal ratification of the Optional Protocol to the Convention on the Rights of the Child on the involvement of children in armed conflict and for adequate resources to set up and maintain sustainable reintegration programmes for former child soldiers.